This verse of Guillen’s speaks of the crystal crest that makes our Caribbean fragile. And also of the fierce beast that lives here. Fragility and ferocity distinguish us. Fragility and ferocity unite us. And unity, we know well, makes us strong. Born of this strength, sustained only by unity, is the very timely Managua Declaration adopted by this meeting, with the title: “Joining forces in the Caribbean to confront climate change,” an issue that has generated growing concern over the last few decades. The Caribbean knows this well since it often suffers the impact. Surely for this reason, since its Second Summit in Santo Domingo, in 1999, the Association of Caribbean States has included among its lines of work agreement and cooperation on climate change and disaster risk reduction. The causes of climate change have been identified by the scientific community and recognized by practically all governments. But neither efforts made or international commitments in environmental matters are sufficient to stop the alarming increase in global temperature and stabilize it in the area of 1.5ºC, as developing countries demand. More developed nations, who are mainly responsible for today’s unsustainable situation, must honor the commitment to provide at least 100 billion USD a year to support the work of developing countries. The global commitment to reduce greenhouse gas emissions must prevail based on the principle of common but differentiated responsibilities, within a framework of international cooperation that ensures the resources and necessary transfer of technologies to developing countries. Required is the modification of patterns of production and consumption that have been imposed on us, and the promotion of a fair, democratic, and equitable international economic order, to confront climate change and achieve sustainable development. Each of us understands what is being talked about. The intensity and persistence of natural phenomena of various kinds in the Greater Caribbean constantly punish us with the adverse effects of climate change, particularly developing small island states. Living with hurricanes has conditioned our lives; modifying our geographies and affecting migration. And it has also educated us in the need to devote more study to these phenomena that plague us and work to reverse the damage they cause. The Cuban Revolution was obliged to learn this lesson very early on, the hard way, during Hurricane Flora in 1963, which left the former province of Oriente under water and took the lives of more than a thousand people. More recent history has shown that, in the worst moments, working together has saved us. We firmly believe that only our unity and mutual cooperation will allow us to face the dangers and effects of meteorological events and assume the subsequent recovery. Along this very line of thought, today, I would like to reiterate the unwavering support of Cuba, under all circumstances, to the right of small island states and developing nations to receive special and differential treatment in access to trade and investment. We also support the just and necessary demand to receive cooperation according to a nation’s real situation and needs, and not on the basis of per capita income statistics that classify them as middle income countries and exclude them from access to financial resources, indispensable for development. We welcome the election of Barbados as President of the Board of Directors of the Association’s Council of Ministers. We express our fraternal congratulations for this and for the country’s willingness to contribute during this period. The President of the United States, the Secretary of State, and the National Security Advisor declare that the Monroe Doctrine is as relevant today as the day it was written, and that it is the country’s formal policy, as in the time of expansion and intervention of the United States in our region, of military aggressions and impositions. These statements and consequent actions challenge our Proclamation of Latin America and the Caribbean as a Zone of Peace, signed by heads of state and government, in January 2014, in Havana, on the occasion of the Second CELAC Summit. We declared then our permanent commitment to the peaceful settlement of disputes in order to banish forever the use of force, and threats to use force, in the region; to strictly comply with the obligation not to intervene, directly or indirectly, in the internal affairs of any other state; to foster relations of friendship and cooperation among ourselves and with other nations, regardless of differences in political, economic, and social systems or levels of development; to practice tolerance and coexist in peace as good neighbors; to the intention of Latin American and the Caribbean states to fully respect the inalienable right of all to choose their own political, economic, social, and cultural system, as an essential condition for ensuring peaceful coexistence among nations; to the promotion in the region of a culture of peace based, among others, on the principles of the United Nations Declaration on the Culture of Peace. The Proclamation also urges all member states of the international community to fully respect these purposes and principles in their relations with CELAC member states. In this context, our nations must continue working together. It is our duty to protect peace, amongst us all, and preserve what has been achieved, confident that the current situation of confrontation and threats will be overcome. Cuba, in particular, has been subject to an irrational and perverse tightening of the blockade by the United States, whose administration has unleashed, at the same time, a campaign of distortions, lies, and pretexts to sustain a policy of persecution and harassment that the international community openly rejects and condemns. I would like to express our profound gratitude to all the countries of the region for their opposition to this irrational, illegal, and cruel policy against our people. Beyond political or ideological differences, I call on all Caribbean governments to defend peace and oppose military aggression and the escalation of coercive economic measures against Venezuela that seriously damage its citizens and put the stability of the entire region at risk. We also reiterate our solidarity and support for the government of Reconciliation and National Unity of the Republic of Nicaragua in the face of destabilization attempts, and we celebrate the negotiation process to ensure peace and preserve the social and economic gains achieved in this sister nation. Faithful to our vision of defending unity within diversity, as on innumerable occasions the First Secretary of the Communist Party of Cuba, Army General Raul Castro Ruz, has asserted in forums like this one, we call on you to continue working together, concentrating on all that unites us, incomparably superior to the little that separates us, and to prioritize the fulfillment of agreements reached by the XXIII Council of Ministers regarding the strengthening and revitalization of the Association. The Association of Caribbean States must continue to be the mainstay of Greater Caribbean unity, which is the only alternative given the enormous challenges we face. Member states of this organization share the responsibility to avoid damaging the consensus that we have built together over the years, and to continue fostering solidarity, as an indispensable premise to develop actions on all the issues that are part of the organization’s mandate. 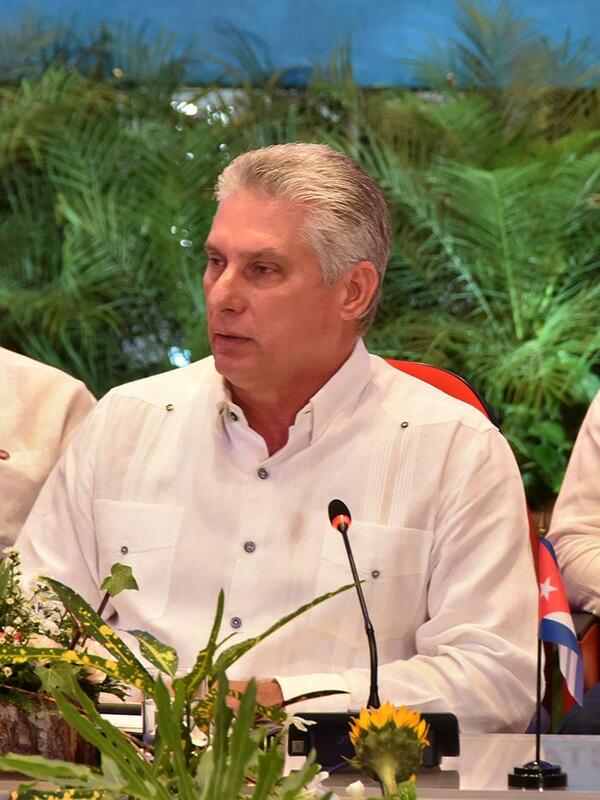 Cuba will continue working in favor of this unity and for the consolidation of our Association, and hope that this important meeting will contribute decisively to the effort.